Dubai: Travellers who own Samsung’s fire-prone Note 7 smartphone will no longer be able to use or charge them while on board UAE airlines, officials said. Etihad and Flydubai issued statements on Saturday barring in-flight use of the phone, which was recalled earlier this month by Samsung after reports of burning and exploding batteries. The statements come after aviation authorities in the UAE, Europe, the US, India and Singapore issued similar bans or advisories on the use of the phone on planes. The UAE’s General Civil Aviation Authority banned the use of the device on board, Saif Mohammad Al Suwaidi, director-general, General Civil Aviation Authority, said on Saturday. The authority also banned the transport of Note 7 in luggage. Emirates said it would “advise” customers not to turn the devices on while on the plane — or put them in checked baggage. “Emirates can confirm that with immediate effect it will advise customers not to turn on or charge their Samsung Galaxy Note 7 smartphones during flights or stow them in checked baggage due to concerns over the phone’s fire-prone batteries,” the airline said in a statement issued to Gulf News on Saturday. Etihad also said that it “has, as a precautionary measure, enforced a temporary ban on the in-flight use and battery charging of these devices on all its flights until the issue is rectified by the manufacturer”. The low-cost carrier’s statement released on Facebook late on Friday. Yet for regulators, airlines, the phone’s owners, and Samsung, the fiery glitch provides little occasion for joy. In the UAE, Samsung on Friday launched a “voluntary exchange programme” for the Note 7 “in response to the recent announcement regarding battery cell issues”. “We acknowledge the inconvenience this may cause,” said the statement, which was carried in coordination with the Ministry of Economy. Worldwide, the voluntary recall applies to all 2.5 million Note 7 phones sold since its roll-out in August. Samsung believes that the battery problem might affect 0.1 per cent of all the phones sold. At least 35 users reported that their Note 7 had caught fire or exploded — either when in use or being charged. In the United States, the federal consumer safety watchdog on Friday issued a stark statement. 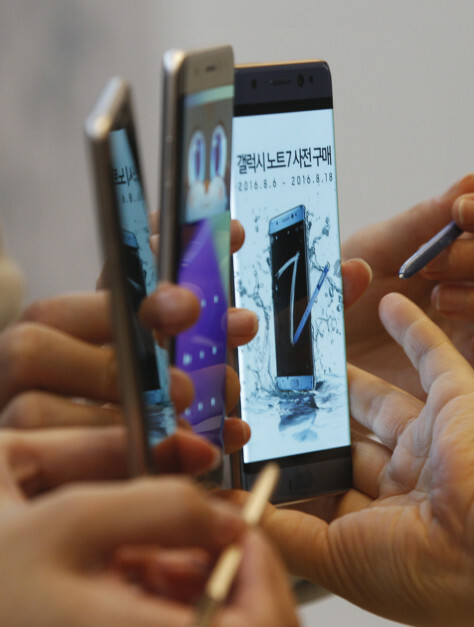 All Note 7 users, the Consumer Product Safety Commission (CPSC) said, should power them down and stop charging or using the device. Almost all CPSC recalls are done voluntarily in conjunction with a company and the scope of any action on the Note 7 may be identical to what Samsung has already suggested to consumers. Consumers who have witnessed their gleaming new phones turn into a melted plastic brick have turned to news outlets and the internet to express their anger. A viral video released on YouTube late last month showed a melted and charred Note 7. The user claimed the device had caught fire while being connected to a charger. Another user — this time a self-confessed Samsung smartphone fanboy — claimed that his Note 7 had exploded while being charged in his car. The smouldering issue has left Samsung with a loss of face — and cash. The recall will cost the manufacturer an estimated Dh3.67 billion, while its shares fell 3.9 per cent in trading on Friday in Korea, the biggest drop since the beginning of the year. Samsung’s strategy centred on rolling out the Note 7 last month to give it a head start on the launch of Apple’s seventh generation of iPhones. But much like the stricken smartphone, the Korean firm’s hopes of stealing a march on the California-based giant have now gone up in smoke.